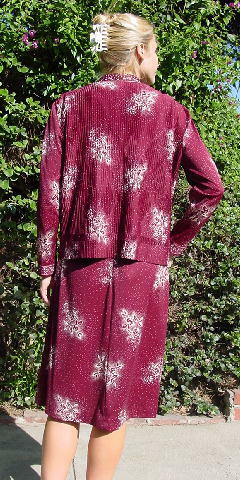 This vintage sleeveless A line dress and matching jacket is by Hal Ferman. 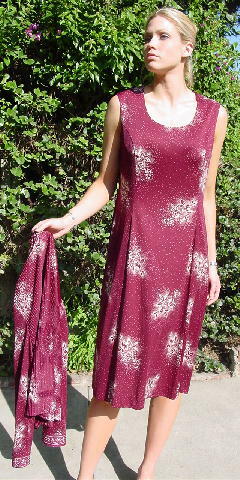 It has a burgundy-wine background with flowers, leaves, and dots in white. There is a wide modified scoop neckline with a back 20" long zipper. It has belt loops, but no belt. Check out our belt section for a good match. The long sleeve jacket has 1 3/4" wide cuffs. There is a band collar and nine fabric covered buttons down the front, and the body of the jacket has the Hal Ferman signature vertical minipleats. side to side bottom hem 33 1/2"